Developing a landscape design for large areas can seem like a challenge, but it ought to be seen as a great opportunity. When planning a design for a large area, it's important to keep several factors in mind. Consider a design that will blend both the space and the local ecosystem. An overall plan, developed by a landscape design agency, will help you to create a cohesive, practical, one-of-a-kind space to enjoy. How do the following factors influence your landscaping? Rare is the piece of property that is absolutely flat, and frankly, you probably wouldn't want your land to be completely flat. Variations in elevation add height, drama, and interest to a landscaping plan, but remember that you don't have to commit to what's already there. We can grade your land to build up certain areas or flatten out others. 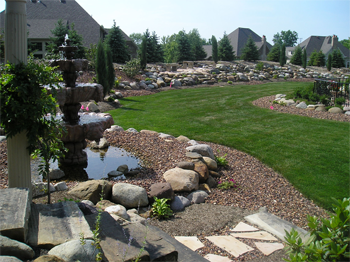 You're not stuck with your current grading; a good Ohio landscape design agency can add terraces, slopes, or nice, wide lawns to your landscaping. When you consider how water moves through your property, you'll realize that it's imperative that you consider how water movement will affect your landscaping. Not only does water movement affect your plants and lawns, but it can also be detrimental to your home's foundation and other buildings if it's not properly controlled. 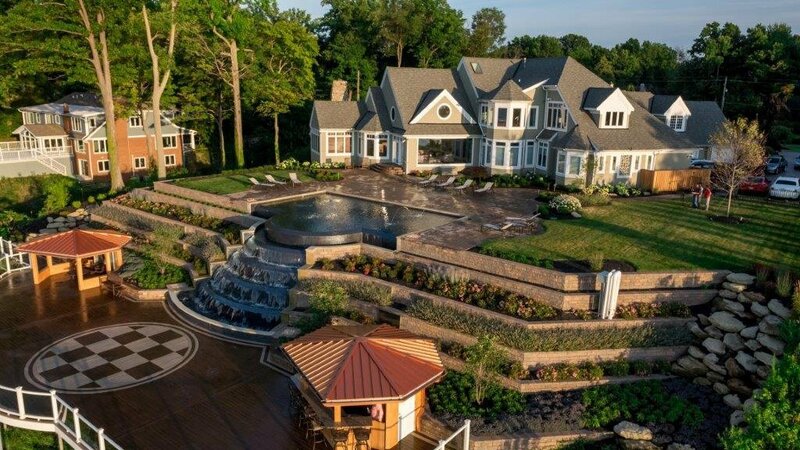 As a longtime Ohio landscape design agency, we know what to expect from the climate, and we also know how to plan a landscaping design to best use the water that will fall on your property. Does your current landscape design take precipitation into account? If you regularly find pools of water on your grass or concrete after rain showers, you might want to reconsider your landscaping plan. A well-constructed plan will use precipitation to help keep your plants and grass healthy, not to create safety hazards and foundation headaches. When you have a large area to landscape, the last thing you want to do is commit yourself to tedious and frequent maintenance. What you need are plants that are easy to take care of that will thrive year after year. The best way to get the right plants is to focus on plants that are native to the area. Native plants don't have to be coddled or babied. You won't have to cover them when frost threatens or bring them in for the winter. Incorporating native plants is a wise way to reduce your maintenance while creating a sophisticated and eco-friendly landscape. One thing you cannot change about your landscaping is the position of your home. Therefore, you must consider how the position of your home and any other outbuildings will influence your design. Do you have a larger side yard than back yard? Is your front yard shallow but in need of dramatic greenery? Questions like these are important to ask when you work with your landscape design agency. To get the most from your landscaping, your design should reflect your lifestyle, personality, and interests, but these considerations must also be balanced with the relationship between the land and the structure of your home. You want your landscaping to look beautiful year-round, but you'll have to do some planning to make this happen. Different native plants flower at different times of year, so you need to know when each plant will create a spectacle. Try to plant an assortment of flowering plants so you always have something in bloom, and consider your overall color scheme. All of these factors require a well-rounded vision for the space that includes thinking about the people who will use it. It's nature and human nature.